Team West-Tec are pleased to be able to reveal the first signing of their 2009 Spanish F3 line-up in Callum Macleod who has signed to drive a 2006 Dallara for the Corby based team. The car will be run in association with Mike O’Brien’s Silverstone based Speedsport concern, former double winners of the prestigious British Grand Prix F3 support race with Darren Manning at the wheel. Callum, 21, was the runaway UK Formula Ford Champion in 2007, but in 2008 only managed a couple of outings in Mike O’Brien’s historic Merlyn Formla Ford, [in which he was victorious at Silverstone and Brands Hatch], a debut outing in the then untried Litespeed F3 car at Snetterton, and a last minute ‘one off’ drive for T Sport in their class B F3 car at Donington when he set fastest lap of the second race. Mike O’Brien said : “with a very tight budget in place thanks to a small group of long time Speedsport supporters, it was decided that the car would be prepared at our premises, and that we would link up with West-Tec for testing and racing purposes. They have two years successful experience in Spanish F3, and in Gavin Wills and Paul South a very solid engineering base which we can benefit from. Early tests indicate that this is going to be a very fruitful and enjoyable partnership”. Gavin Wills, Team West-Tec Co-Principal : “ I am absolutely delighted we have signed Callum, as he is a very exciting driver. I am looking forward to working with him, and achieving success together”. John Miller, Team West-Tec Co-Principal : “ Callum should be a very good signing for us. We have now raced in Spain for two seasons, during which time we have taken one championship, won 12 races and taken 30 podiums. In 2009 we are determined we will be fighting for both the drivers’ and teams’ championships, and Callum is going to be a very important part of that. 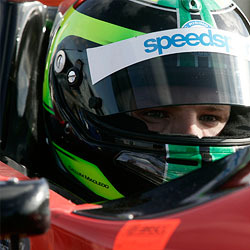 Callum is a quality driver with an excellent pedigree and I look forward to seeing him on the top step of the podium.